Photo Chess Trivia: Who's this Chess Stalwart? 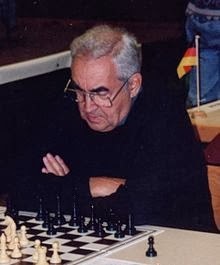 Can you name this chess stalwart? He has played the USSR Chess Championship 23 times and celebrates his birthday February 7. This Grandmaster also has the unique distinction of being a concert pianist. Click photo to read his Wikipedia page. GM Chess Analysis Video: Move-by-Move Explained!